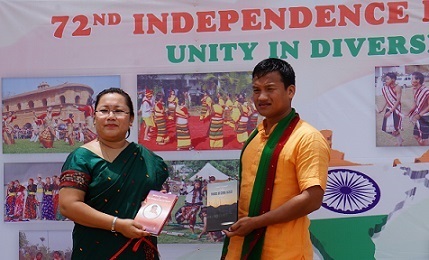 Chief Executive Member (CEM) of North Cachar Hills Autonomous Council (NCHAC) Debolal Gorlosa on Wednesday released two books at Haflong, the headquarters of Dima Hasao district and NCHAC. The books released by the NCHAC CEM are ‘History of the Dimasas & Other writings of S.R. Thaosen’ by Vandana Thaosen and ‘A brief account of the tribes of Dima Hasao Assam’ by Ramdina Lalsim published by the Department of Information & Public Relations (Hills), Haflong. Authored by Vandana Thaosen, granddaughter of late SR Thaosen, the book titled ‘History of the Dimasas & Other writings of S.R. Thaosen’ is a collection of writings by late Sonaram Thaosen, one of the few enterprising Dimasas. SR Thosen’s enterprising spirit reflected in his life and writings. He was an able leader, a successful organiser, a social reformer, an educationist and a writer. As a writer he stands out from other writers of the community for his multi-lingual skill. This volume includes 22 pieces of writings, out of which 17 are in Dimasa dealing with various issues concerning the Dimasa society, four in English and his autobiography in Bengali. Vandana Thaosen is a senior faculty member at Gurucharan College, Silchar and the eldest of the grandchildren of late Sonaram Thaosen. She states that the book is a collection of relevant factual writings of reflective materials such as essay, speech, memoir, editorials, etc. and gives glimpses of the emphasis on values of meticulous observations and clarion call to the youth to claim a world for themselves and beyond. The narrative is a loose sequence of different thoughts and issues but gives adequate glimpse of social constructiveness of the times. The other book, written by Ramdina Lalsim titled as ‘A brief account of the Tribes of Dima Hasao, Assam’, is an effort by the author to highlight the traditions, culture, habits, feast and festivals, etc. in brief so as to let the outside world know about the small unknown tribes in the district. The hill district, which is a home for several colourful and warm-hearted tribes, endowed with rich flora and fauna, lovely natural scenery of rolling valleys, forest, blue hills, hilly paths and sparkling streams. This book would help the readers of rest of the world to understand the people of Dima Hasao, where they come from, who they are and many more aspects of the tribal people of this hilly district. The author, Ramdina Lalsim, a local resident of Haflong in Dima Hasao, is a passionate writer and photographer. He has already written a large number of articles and stories.